Councilman Buscaino was first elected in 2012 to fill the seat vacated by Janice Hahn, following her successful bid for US Congress. He was re-elected to his first full four-year term on March 5, 2013. 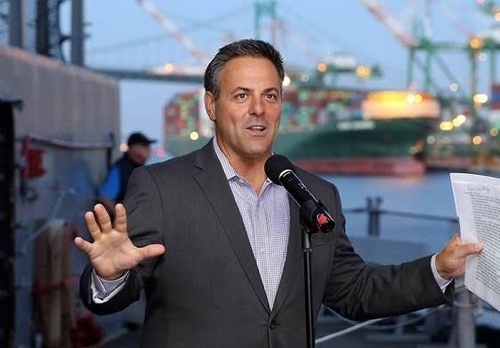 In 2017, Councilman Buscaino was named Chair of the new Trade, Travel, and Tourism Committee which oversees the Port of Los Angeles, LAX, and the LA Tourism Bureau. He was also named Vice Chair of the Economic Development Committee, and Vice Chair of the Public Works and Gang Reduction Committee. He is also a member of the Public Safety Committee, and the Ad Hoc Committee on the 2028 Olympics and Paralympic Games. Councilman Buscaino serves as the Mayor’s appointee to the South Coast Air Quality Management District. In addition to serving as an AQMD board member, he is on the AQMD's Legislative Committee, serves as Vice Chair of the Technology Committee; Vice Chair of the Refinery Committee; and Climate Change Committee, Vice Chair. Councilman Buscaino represents the 15th Council District which includes the Port of Los Angeles and the communities of San Pedro, Wilmington, Harbor City, Harbor Gateway and Watts. Prior to his election to the City Council, Buscaino served for 15 years as a police officer in the Los Angeles Police Department. The Councilman and his family live in San Pedro. Parking is located at the Topaz Building, and the entrance to the structure is located on Centre Street between 5th and 6th Street.